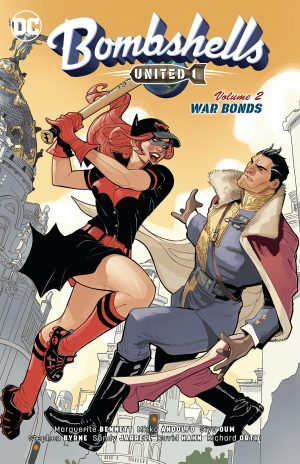 Marguerite Bennett breaks with tradition to open The Death of Illusion, with the Batgirls of Gotham only seen in passing during the opening chapter, amid a rhyming musical looking in briefly on the entire cast of Bombshells wherever they may be during World War II. It’s clever, sweet and ends ominously by revealing the title to be ‘The Beginning of the End’. 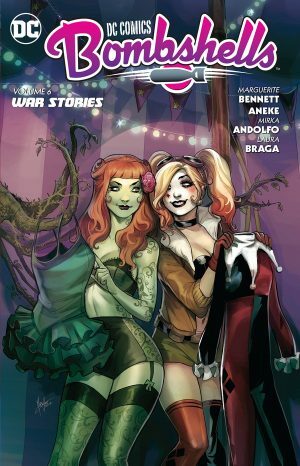 This is the penultimate DC Comics Bombshells collection, and many Bombshells are now resident in Atlantis, Mera having made refugees welcome in her undersea kingdom. That’s not the main focus, however, beyond a few people leaving, as the Nazi siege of Leningrad is tightening, and Harley, Poison Ivy, Raven and Supergirl are drawn there. Lex Luthor and Hugo Strange are also seen for the first time in a while, both true to their characters in the primary DC universe, so both villains, although with different motivations. In this world few men are presented in a positive light, although there are also female villains. 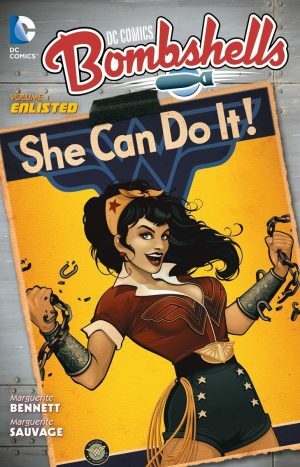 The best surprise is a variation on another DC hero seen toward the end of the main continuity. It’s a doozy, honestly. Mirka Andolfo has changed her style slightly since drawing the earliest Bombshells, now devoting less time to backgrounds, and taking on a manga influence for her facial features. There’s no change to the fine work of Laura Braga (sample spread left), who supplies some beautiful views of Russia, while Carmen Carnero and Richard Ortiz are fine on their contributions. 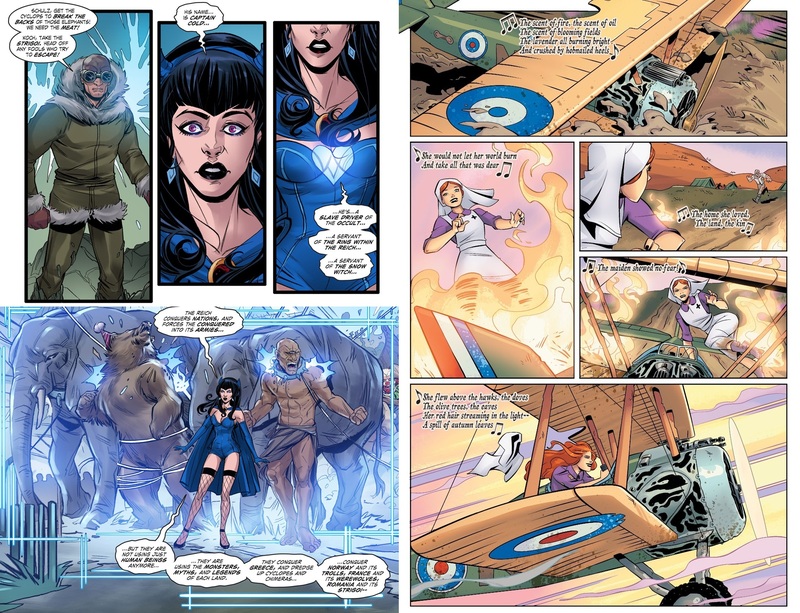 Aneke and Rachael Stott are both newcomers to the art team, and both excellent, and Elsa Charretier (sample spread right) draws the longest story, as we learn of Barbara Gourdon and her achievements before a trip to the Louisiana swamps. 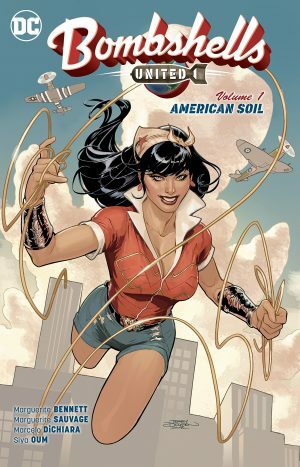 It’s largely unconnected to the main story, although does feature people we’ve seen before, and is a thoroughly entertaining diversion with Charretier’s cartooning gorgeous. There’s never been a problem with the art, but the previous Queens was a ho-hum volume on Bennett’s part compared with earlier collections. There’s a greater sense of progress and circumstance to The Death of Illusion, a sense of moving toward a purpose, and since War Stories is the final volume of the series, we’ll discover what that purpose is.